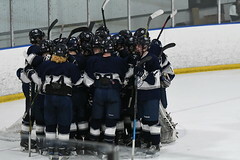 Yarmouth fell 5-1 to Edward Little in their final pre-season game. Charles Henry Watson ’22 was outstanding in net as he showed remarkable quickness moving post-to-post and good rebound control. 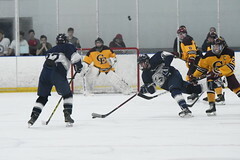 Aidan Miller ’20 scored Yarmouth’s only goal on a nice, individual effort. The Clippers will look to pull it together for their season opener against Maranacook on Saturday, December 8th. Game time is 8:10 pm. The JV Boys opened their season with a loss to Greeley. 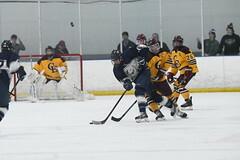 Click here for game photos. The Junior Varsity will be back in action against Mt. Ararat/Lisbon on Friday, December 7th. Game time is 8:05 pm at Casco Bay Arena.